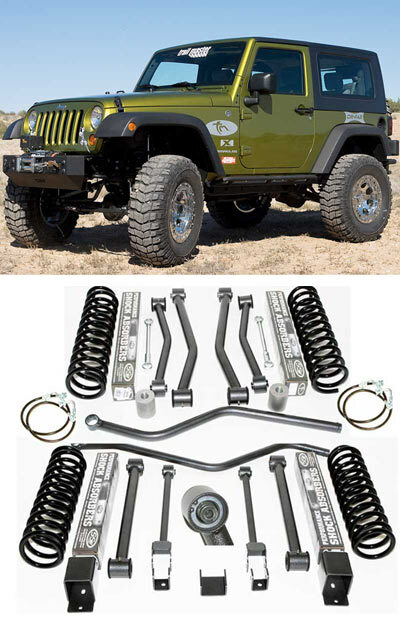 Chino Valley, AZ - Trailmaster Suspension has released their new 5" suspension kits for '07-'08 Jeep Wrangler JK and Unlimited models. * Engineered by Jeep enthusiasts with sportsmen and rock crawlers in mind. * Trail Master coils and SSV shocks for a great ride on and off-road. * Standard quick disconnect sway bar links. * DOT approved braided steel, kevlar lined brake lines for front and rear included. * .156 Walled DOM tube replacement upper and lower control arm with flex joint for mavimum articulation. * Replacement front and rear track bars with heim joint ends for proper geometry and bind free movement. * An affordable package for the off-road enthusiast. * Fits 2 and 4 door JK, JK X and Rubicon models. * Easily accommodates 35" tall tires. * Kit includes detailed instructions and all necessary mounting hardware. * Easy to install: approximately 4 to 6 hours installation time. * OEM factory CV joints cannot withstand the new differential angles produced by lifting the vehicle thus wearing standard CV driveline prematurely. Therefore Trail Master Suspension strongly recommends upgrading to our front and rear double cardan drive lines for added durability and reliable off-road performance. Trail Master offers the convenience of purchasing suspension systems complete with drive lines or the option of purchasing the drive lines at a later date. Complete Kits: 2-Door Model PN J4615SSV / 4-Door Model PN J4616SSV Drive Lines: 2-Door Rear PN 951302 / 4-Door Rear PN 951304 / Front 2 & 4 Door Models PN 951303.